Guohui Yuan received his BS from Tsinghua University, Beijing, China and PhD from the University of Maryland, College Park, both in physics. He has 15 years of experience in the energy and communication industries in various capacities. Currently he is a lead technical advisor to the DoE SunShot Initiative, managing the photovoltaic (PV) grid integration R&D portfolio. Previously he was the Director of Product Management at CURRENT Group, responsible for the development of advanced distribution management software and smart grid system integration. Before that, he was the Director of Systems Engineering at GridPoint and a system architect. Prior to that, he was the lead control engineer at WaveCrest Labs, developing electric propulsion technologies for EVs. He holds 9 US patents and has numerous publications. 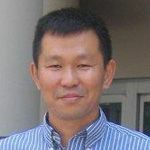 He is an IEEE senior member and DistribuTECH Advisory Committee member.